If you haven't already, head over to Balanced Sports to see my tribute to Anil Kumble. I don't know why I hadn't written one before, but I have now, and it's great (but of course I would say that). Anyway, here's the piece, if clicking on links isn't your thing. The lasting image of Indian cricket in the 1990s is that of a young Sachin rising to prominence, fulfilling the prophecies that had marked him as a demi-god early on. However, only a few months after the Test debut of India’s greatest batsman, another young man began his Test career; a man who was India’s steadiest, most consistent bowler in the 90s, who would eventually become India’s highest wicket-taker. If you’re thinking of Venkatapathy Raju or Atul Wassan, stop. The man I’m speaking of is Anil Kumble, one-third of the 600-wicket club alongside fellow leggie Shane Warne and fellow Beethoven-lover (I cannot confirm that) Muttiah Muralitharan. 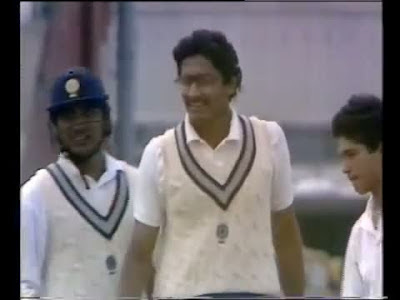 My own fascination with Anil Kumble cannot really be attributed to one thing in particular. Entering the teen years for me was like waking up from the Matrix; I was suddenly aware of cricket and I decided that I liked it. India had been beaten in the World Cup final a few months earlier, and now they were playing the champions in their backyard. I didn’t know many of the players, so I was free to make my own judgements without being influenced by reputation. I saw Kumble running in to bowl over after over, seemingly every day, with the bouncy run-up and the skillful release from high above his wiry frame. I got to see plenty of him in my first full Test series, because he bowled in excess of 40 overs in four out of the six Australian innings, for a total of 24 wickets, the mastermind behind India’s closest attempt yet at winning a series in Australia. His 8-141 in Sydney is one of my favorites, and is unfortunately hard to come by. It was easy for me to relate to him. Like him, I started playing cricket attempting to be a fast bowler (I never got past slow-medium full-tosses), before becoming a legspinner. And like him, I was a colossal nerd. And I don’t mean he looked like a nerd just because he once wore glasses like Daniel Vettori – he was the real deal, as you can see in this picture below. Practically twins, him and I. Who’s that kid on the right? And who’s that future commentator on the left? His relatable geekiness is the result of being a keen student – he succeeded in becoming a mechanical engineer before he played Test cricket. As he isn’t someone who turns the ball a great deal, he presumably puts his finely-tuned mind to the task - seeing every batsman as a Physics quiz, asking question after question until he finds the answer. He finds the smallest chink in the batsman’s technique and works on it until he gets the wicket. Aiding him is his arsenal of deliveries – the stock legspin, the wrong ‘un and probably several different kinds of flippers. His strongest attribute, though, is considered to be his never-say-die attitude towards bowling – this has helped him and his team when they have most needed it. If the first half of his career ended perfectly when he took that classic 10-74 against Pakistan in 1999, the second half began with injury and the rise of another spinner, Harbhajan Singh. With his position under threat for the first time in his career, Kumble bowled despite the pain of a broken jaw in the West Indies in 2002, and then developed his bowling to much greater effectiveness – the noughties yielded 355 Test wickets, a vast improvement on the 264 wickets in the previous nine years. The numerous prolific years since 2002 led to him eventually leading India in 2007, two months after his entertaining maiden century against England. This was a short transitive phase, with the captaincy expected to pass to MS Dhoni at the end. Nevertheless, Kumble led well, as India won a home series against Pakistan for the first time in 27 years, and his diplomacy was vital during the controversy-filled tour to Australia. Age and injuries set in again in 2008, unfortunately, and by then he was well past his best (though he would come back strongly in the IPL). He retired mid-series in the home Tests against Australia (who I notice have been mentioned quite a few times in this piece). I knew the retirement was coming, had even secretly hoped for it when he was going wicketless because I couldn’t bear to see this shadow of a great bowler. When it came, I wept anyway. Not openly, of course, I wept with the minds’ eyes of my mind’s eyes. He ended his career at the right time, when the Indian candle was burning bright, when they were on the road to #1, when the young players should have been given their trials for the future. With Anil Kumble gone, India cannot be sure of winning even on a turning track, because they have no one as good to exploit it. It’s clear that he wants to be a part of the behind-the-scene improvement in Indian cricket, but if the board cannot do whatever it needs to to retain his services, they do not deserve success. I leave you with one of the best things I’ve ever watched, a profile of him from 1995, when he was with Northamptonshire. Exit stategy (I intended to spell it that way): He bowled approximately 55,000 deliveries in international cricket, around 6000 more than Sachin has faced.